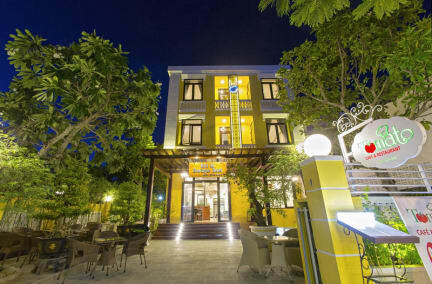 Welcome to my Hai Au hotel in Hoi An town - Vietnam. My hotel located in the centre of Hoi An ancient town, Hai Au hotel is in the middle of a well-ventilated and quiet place. It only takes 5 minutes to walk to the downtown to visit World Cultural Heritage and 20 minutes to go to Ang Bang beach by bicycles. The hotel with 41 well-equipped bedrooms have balcony looks nice view, up to international standard is possible to serve international tourists. All the rooms have air conditioning, mini bar, satellite TV, IDD telephone, hot water,bath room with bath-tub, wireless internet and swimming pool outsides with sunny. Hotel have restaurant service 24hours and buffet every morning. 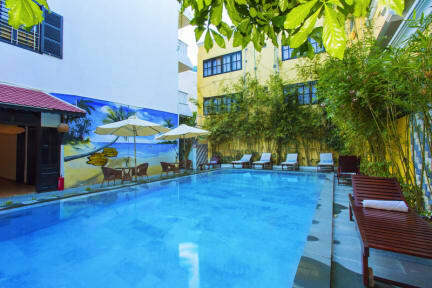 Hai Au hotel with highly qualified, friendly staff will ensure that you have a pleasant, memorable stay.